Quantum entanglement is one of the more bizarre theories to come out of the study of quantum mechanics—so strange, in fact, that Albert Einstein famously referred to it as "spooky action at a distance." Essentially, entanglement involves two particles, each occupying multiple states at once—a condition referred to as superposition. For example, both particles may simultaneously spin clockwise and counterclockwise. But neither has a definite state until one is measured, causing the other particle to instantly assume a corresponding state. The resulting correlations between the particles are preserved, even if they reside on opposite ends of the universe. But what enables particles to communicate instantaneously—and seemingly faster than the speed of light—over such vast distances? 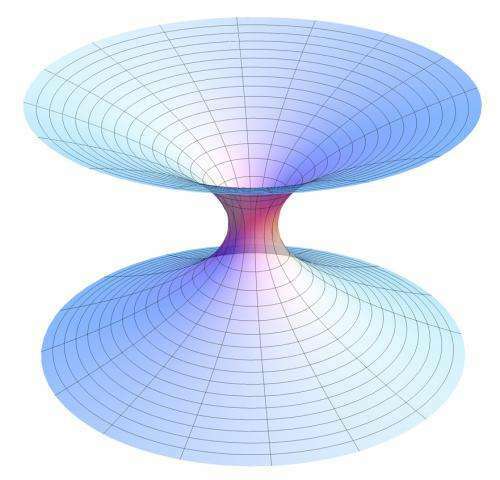 Earlier this year, physicists proposed an answer in the form of "wormholes," or gravitational tunnels. The group showed that by creating two entangled black holes, then pulling them apart, they formed a wormhole—essentially a "shortcut" through the universe—connecting the distant black holes. Now an MIT physicist has found that, looked at through the lens of string theory, the creation of two entangled quarks—the building blocks of matter—simultaneously gives rise to a wormhole connecting the pair. Julian Sonner, a senior postdoc in MIT's Laboratory for Nuclear Science and Center for Theoretical Physics, has published his results in the journal Physical Review Letters, where it appears together with a related paper by Kristan Jensen of the University of Victoria and Andreas Karch of the University of Washington. Ever since quantum mechanics was first proposed more than a century ago, the main challenge for physicists in the field has been to explain gravity in quantum-mechanical terms. While quantum mechanics works extremely well in describing interactions at a microscopic level, it fails to explain gravity—a fundamental concept of relativity, a theory proposed by Einstein to describe the macroscopic world. Thus, there appears to be a major barrier to reconciling quantum mechanics and general relativity; for years, physicists have tried to come up with a theory of quantum gravity to marry the two fields. "There are some hard questions of quantum gravity we still don't understand, and we've been banging our heads against these problems for a long time," Sonner says. "We need to find the right inroads to understanding these questions." This is where quantum entanglement could play a role. It might appear that the concept of entanglement—one of the most fundamental in quantum mechanics—is in direct conflict with general relativity: Two entangled particles, "communicating" across vast distances, would have to do so at speeds faster than that of light—a violation of the laws of physics, according to Einstein. It may therefore come as a surprise that using the concept of entanglement in order to build up space-time may be a major step toward reconciling the laws of quantum mechanics and general relativity. In July, physicists Juan Maldacena of the Institute for Advanced Study and Leonard Susskind of Stanford University proposed a theoretical solution in the form of two entangled black holes. When the black holes were entangled, then pulled apart, the theorists found that what emerged was a wormhole—a tunnel through space-time that is thought to be held together by gravity. The idea seemed to suggest that, in the case of wormholes, gravity emerges from the more fundamental phenomenon of entangled black holes. Following up on work by Jensen and Karch, Sonner has sought to tackle this idea at the level of quarks—subatomic building blocks of matter. To see what emerges from two entangled quarks, he first generated quarks using the Schwinger effect—a concept in quantum theory that enables one to create particles out of nothing. More precisely, the effect, also called "pair creation," allows two particles to emerge from a vacuum, or soup of transient particles. Under an electric field, one can, as Sonner puts it, "catch a pair of particles" before they disappear back into the vacuum. Once extracted, these particles are considered entangled. Sonner mapped the entangled quarks onto a four-dimensional space, considered a representation of space-time. In contrast, gravity is thought to exist in the next dimension as, according to Einstein's laws, it acts to "bend" and shape space-time, thereby existing in the fifth dimension. Using holographic duality, Sonner derived the entangled quarks, and found that what emerged was a wormhole connecting the two, implying that the creation of quarks simultaneously creates a wormhole. More fundamentally, the results suggest that gravity may, in fact, emerge from entanglement. What's more, the geometry, or bending, of the universe as described by classical gravity, may be a consequence of entanglement, such as that between pairs of particles strung together by tunneling wormholes. "It's the most basic representation yet that we have where entanglement gives rise to some sort of geometry," Sonner says. "What happens if some of this entanglement is lost, and what happens to the geometry? There are many roads that can be pursued, and in that sense, this work can turn out to be very helpful." I love theoretical physics, but I'll wait until someone designs an experiment to test it. Ok, this may sound a bit, well, trekkie. But is it possible, with the discovery of the wormhole, that a SINGLE particle is occupying both spaces at once? I think they are wrong. The 'shortcut' already exists for photons without the need of wormholes. At the speed of light time and distance cease to exist so that the point of emission and absorption of a photon effectively occur at adjacent points in space regardless of the distance measured by observers not travelling with the photon. Time, relative to a space observer is also frozen for black holes and thus the distance between two black holes is zero as measured by the observer at the event horizon despite the separation distance as measured by any other observer. This is all chicken feather voodoo physics. Just more cr@p to add to the mountain of cr@p that modern theoretical physics has been sitting on for some time now. It's pathetic. Sorry. The actual truth is that particles do not communicate over vast distances. There is simply no distance, period. Google "Why Space (Distance) Is an Illusion" if you're interested. I like John comment although I think its more along the lines of two points in space can be the same point in space under certain circumstances. Ichisan I believe is alluding to this. Not only does space not exist as we conceive of it, neither does time, or mass for that matter. The question of why these phenomena seem to exist at the time/size scale we term macroscopic is also a big question and I'm thinking intricately linked to "perception"
Seems like creating many, many entanglements in the lab might produce an increase in local gravity. Should be very testable. It certainly is interesting that a photon, which is 'produced' by an electron's change in energy, does not experience time, which suggests for the photon there is no distance and all phenomena are implicitly entangled but, perhaps at a very subtle level and this is the issue of gravity - as alluded to by some here. The entanglement observed in the lab could well be a far less subtle form but, still does not let us get past the issue of relativity in terms of the time of information transfer from our reference frame. It is a great mind-bender to place oneself upon the photon (and other particles) from the context of special relativity and especially so after consuming a couple of glasses of red wine in good female company, expending biochemical energy ;-) then have the fortunate experience of a powerful vivid dream leading to surrealist lucid dreams ! Phothon is the one who is actually making distances and time. The distane is measured by time it takes for photon to travel and time is measured by distance photon travels in time. Not only entangled particles form wormhole, also single particle can occupy big volume in space and instantly collapse (collect all his energy into tiny volume) and that happens also instantly, outside of space. This is what create the famous particle -wave duality and explain all related experiments (double slit!). You may downvote me above to your heart's content but it's still a bunch of cr@p. Do you people even know that nothing can move in spacetime, by definition? Apparently not. And do you know what a changeless spacetime means to wormholes? Never mind. You all just love this pathetic Star Trek voodoo physics. It's a religion to you people. A religion of cr@p, that is. Fire away. If you know so much about this subject, why are you wasting time posting here? Write a book, get famous and rich and make us all look stupid. Go on now, get going. Hurry up, I'm waiting. There's no need for me to write a book and I have no desire to get rich or famous. The undeniable fact is that nothing can move in Einstein's spacetime which makes claims of communication via wormholes look stupid indeed. Look it up. I did not make this stuff up. It's the dirty little secret of spacetime physics that nobody wants to talk about because it would make many big names in physics look bad. 2. Einstein's predictions re SR & motion are experimentally proven to a high degree. 3. We observe motion and in Minkowski space too which also confirms Einstein's SR.
Can you articulate please why you so sternly believe there is no such motion in Einstein's spacetime to resolve the above seeming paradox of item 1, 2 & 3 ? Mike_Massen, time cannot change by definition. Why? Because a change in time necessarily implies a rate of change which would have to be given as v = dt/dt, which is nonsensical. Mike, you say that Einstein's theories have been confirmed to a high degree but this is not completely true. Einstein's physics squarely contradicts the reality of quantum entanglement (action at a distance). Take the electric field around an electron. Einstein's physics predicts the electric field changes at the speed of light. But this has never been shown. The more likely truth is that the electric field is a non-local phenomenon and that the entire field, regardless of how far away it is from the electron, will move precisely in lock step with the electron. And when all is said is done, it will be shown that gravity, too, is non-local and instantaneous, just as Newton's gravity equation assumed. guys, einstein helped build the very foundation of quantum mechanics even though he did not like what it suggested. "spooky action at a distance" ... he also showed the implausability of a wormhole due that even if it instantaneousely happened it would immediately collapse. Look up einstein rosen bridge. It's all wormholes, all the way down. - Can you maintain focus, I referred only Einstein re SR re Item 2 my comment. - Observations confirm distance & time & reproducible relational time aspect. - You claim 'definition' re time hmmm but, bear in mind best fit for SR observations is change in time rate, easy to conceptualise, no need to get stuck on 'definition'. - You may not like existing maths but, concept is plausible & consistent with radioactive decay (RD) rates. - Maths re SR & with RD work; Keating experiment, GPS etc, you have alternate maths fitting observations ? Please present instead of making weird unscientific comments. - Your attempt to vilify current maths re time does not invalidate myriad SR & GR confirmations. Eg. Re GR, If I move an instrument/reaction/isotope etc to Inertial Ref Frame (IRF) of high gravitational field (GF) for long enough to register differential & move it back to IRF of low GF it acts *exactly* as if rate of time has changed! If it quacks like a duck, then ? Can be photons entangled by wormhole, if they're massless? Massen, you're wasting both my time and your time. See you around. - Please focus on the Science & for those others observing your odd response? - Please articulate the mathematics which correlate well with observation but, are different to Einstein's SR which you claim are so incorrect ? - Perhaps you need a good day to cool down, you do seem angered severely - why ? - Looking forward to YOU following the highest ethic & integrity of Science to not only describe your theory well but lay the foundation for an Adult & mature dialectic ? - Are you up for the straightforward challenge then ichisan & without odd anger ? - Looking forward to your well thought out & considered theory citing, where possible mathematics, along with as many peer reviewed references you can muster ? - In the meantime, this might be of interest to you & all those watching your responses. OK oK ok ok, not read the article yet, just the header. ... This is going to be tasty, if not the article itself, the discussion will. ok, halfway through the article: " gravity is thought to exist in the next dimension as, according to Einstein's laws, it acts to "bend" and shape space-time, thereby existing in the fifth dimension." Finished it. Nice to hear something from the string theory corner, which at the least usually have an interesting theory to look at matter. And it doesn't even sound very impossible to comprehend as a layman (not that that brings any validity to the theory). I hope this won't be buried in 10 years of silence and scientists are able to put some of these things to the test, it would be really interesting to know more about this stuff. And I actually thought at your first post you might have something sensible to say about shortcomings of theoretical science. Doesn't the very idea of knowing it better than Einstein without having any tangible form of knowledge to explain a reasonable alternative make you wonder about yourself? You want to know why China killed their intellectuals in the shake out of the revolution? Because they knew that thanks to our magnetar sun during its delayed magnetic reversal, there would be more. I'm a lot more interested in the magnetic reversal hanging for another decade or two and reading what our brilliant babies have to say. Does anyone else have some site called science x that is asking to make an account just to see your physorg profile ? Our universe is just one of an infinite number of others in the Grand Multiverse. Time is infinite, both forward and backwards and possibly in other directions we can't imagine. There are multiple dimensions. Our three dimensional Euclidean existence is only a partial view. The energy that created our universe had to come from somewhere. It has been proven that energy never ceases to exist, it only changes form. In a multiverse, energy is infinite and unlimited. It moves/changes form from one 'verse to another as needed. We are also energy and the same rules apply. I don't accept the current viewpoint of most physicists about dark matter. When energy is outside our 3d existence and resides in another 'plane', it still has a connection. One of these is gravity. The fact that quantum entanglement creates a tunnel or wormhole makes perfect sense. This tunnel has to exist in some other dimension. So these extra dimensions are actually the glue that holds everything else together. Falaco solitons illustrate well the entanglement mediated by worm hole. My problem with it is, such a worm hole can be created just around massive bodies, which the photons aren't. Therefore, by this model the entanglement between photons shouldn't be possible - but we are still observing it. http://www.ussdiscovery.com/FalacoSystem.gif illustrate well the entanglement mediated by worm hole. My problem with it is, such a worm hole can be created just around massive bodies, which the photons aren't. Therefore, by this model the entanglement between photons shouldn't be possible - but we are still observing it. We've all heard of nano black holes by now. Are photons really just nano WHITE holes? A white hole ejects mass and light, and a photon has zero rest mass…. If the best example of a white hole is the Big Bang, then a nano white hole, it seems, would have to eject at least SOME mass. At least, IMHO anyway. If this is wrong, I would love to hear why… especially by someone like Q-Star or someone in the field! As you say 'photons have zero rest mass' but, they aint at rest. They have energy, this may have arisen any number of ways prior to leaving a hole or sun or planet etc. So knowing the mass equivalent of a photon (@ particular frequency) then from E=mc^2 & one or more other formulae that escape me for moment (nice chicken massala with much beer), you can work out how much mass is leaving a body by knowing its energy etc. However, from special relativity a photon doesn't actually exist as it experiences no time as it travels on what is called a 'null geodesic', from our frame of reference the photon is; generated, travels & is absorbed. In the photons reference frame the cause & the effect are coincident & therefore as far as the time issue is concerned the two happen simultaneously. Light=energy. Speed of light is the point where energy has been affected/slowed enough to become visible in our Universe as - light. Which then, by a series of complicated interactions between energy and the absence of energy that I'm not smart enough to detail, eventually becomes matter. It's a matter of "friction", if you will, between light and space that does the "work". Damn - did I just sort of agree to Zeph's AWT? thanks for the feedback… I am trying to learn. According to what I have learned SO far… Space is not technically empty, as far as QM is concerned. It continually has a charge because virtual particles are constantly popping in and out of existence. This is according to Quantum theory, which has SCADS of proof, experimental and empirical data, unlike AWT. kThis link talks about empty space not being empty as well as the Casimir force which is due to space not being empty. The "charge" being a wave generated by all those virtual particles interacting with light (when they happen to appear in the vicinity of it)...? This link talks about empty space not being empty as well as the Casimir force which is due to space not being empty. Sean Carroll actually comments about how some people have said that the existence of the Higgs field makes it look like the AWT thoery has credence, BUT also tells a bit about how it is totally different. when i find the link, i will post it. You can get his book on the Higgs and it is VERY detailed and explanatory. i loved it! also, you can watch some of his you-tube video's (there may be some where he explains the Higgs field, and relates it to AWT). the AWT theory was disproved, and until i see EMPIRICAL data, with experiments that can be done, then i will firmly side with the standard model... HOWEVER, i also keep an open mind. i go where the evidence points, not where i want the evidence to take me. part of being a good investigator. Admirable but, evidence by itself is dry, free of expectation & passion & hypothesis. I do appreciate your approach but, in order to make sense of evidence in some framework then imagination is essential & the more support of foundation/scaffolding then the more such physics has cohesiveness regardless of whether it appears to make sense. Eg. Probabilistic issues, which is what I infer from the so called Casimer effect. To me, any particle type is a "unit" which 'excludes' a certain range of probabilities. ie. It is REAL because it has excluded those virtually infinite probabilities which appear present in so called empty space & this is why the Casimir effect works ! In my universe, the degree to which a particle excludes more probabilities gives it more mass - as mass is a measure of "fixing" virtually infinite probabilities of empty space in the 'present'. Mike and Cap'n. Both way cool responses! I am not a scientist. However, as an artist my imagination is on fire! a. the virtual particles are always there, but the metal (mass) causes them to slow down enough to (electro-magnetically) interact with matter thus creating energy? b. Or are the virtual particles products of the two plate's mass and proximity? Also... We mathematically measure (particalize) space in order to measure it (ie-Planck space). If we can do that, then doesn't that really mean any space is a "virtual particle"? And ALL space is a wave of those "particles" constantly in motion? From what I surmise from the Casimir effect, any empty space has a certain amount of charge potential. That would mean it has something in it to carry/hold that potential, right? Admirable but, evidence by itself is dry, free of expectation & passion & hypothesis. sorry, I make the approach I do because of my training. I am a professional investigator, retired. Old habits die hard. about space and virtual particles? according to what i have read and my interpretation of it, EMPTY space is just not as empty as we think, because empty space has virtual particles popping into and out of existence continuously. Therefore we cannot directly measure these virtual particles popping in and out, but we CAN measure the energy that they leave behind when they do. If I accept the idea of VP popping in and out, my next question is - do they do it randomly or in a synchronized pattern? From both a geometric and timing perspective? take a look ... I am going through the pages now, whenever I get time to sit and read.